Al Hidden is an experienced Gloucestershire based copywriter specialising in Client case study writing, Marketing, Web/SEO, technical and PR copywriting. 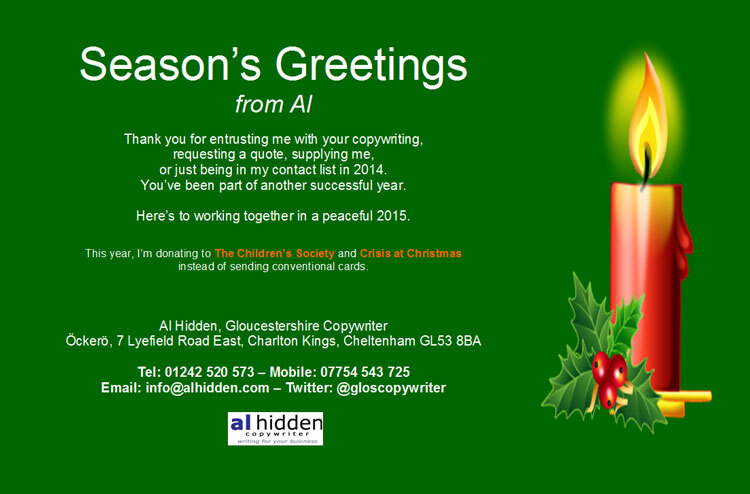 This entry was posted in Copywriting Resources, Thank you blogs and tagged 2014, cheltenham copywriters, client case studies, client case study writing, copywriters gloucestershire, gloucestershire based copywriter, marketing, pr copywriting, season's greetings, technical copywriting on December 22, 2014 by alwrites. This is my 100th blog post, so I thought it had better be a cracker. Al Hidden is an experienced Gloucestershire based copywriter specialising in article writing, Marketing, Website and SEO copywriting, technical and PR copywriting. This entry was posted in Copywriter rants, Copywriting ideas, Copywriting Resources, Copywriting Skills and tagged $5 for an seo article, article writing, copywriters gloucestershire, elance, fiverr, poorly written copy, seo article, seo articles, seo copywriting on December 16, 2014 by alwrites.